After studying abroad here in Denmark until May, I was not quite ready to leave. For the past three months, I have interned at arki_lab to develop a book project on their design philosophy, which had long remained in a theoretical stage. I received a grant from my university in the U.S. for a summer combined internship and research project in Copenhagen, and my collaboration with arki_lab was a perfect fit. My personal research interests include the cultural climate of an urban design office within a welfare society and how that differs from market economy design practices, as well as how the outcomes differ in their conceptual driving points. Through the process of facilitating workshops amongst the staff and participating in the workshops arki_lab conducts in Copenhagen schools, I received a first hand glimpse into the structure of a collaborative design office that is passionate about co-creation and citizen involvement. I can tell you that the people who work at arki_lab don’t just talk about ideas of participatory design in the abstract—they are ready to act and take their design values with them even after leaving the office. 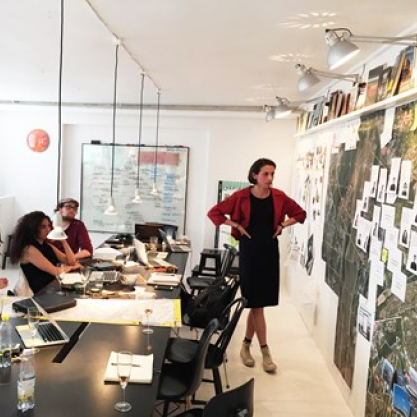 My time at arki_lab has been a valuable part of my abroad experience for the insight it has given me into the inner workings of a Copenhagen urban design office and its relationship to the rest of the city. For me, it has been a true cultural experience to compare a Danish work environment to one from the United States (especially since most of my previous experiences have been in New York City, whose work-life balance is notoriously the opposite of Copenhagen’s). So, how did I approach the challenge of packaging arki_lab’s multi-disciplinary design approach into a focused book? During my first conducted office workshop, I asked my co-workers to think about how arki_lab should define itself, and what makes it unique. I asked them to rethink conventional ideas of “master planning” in order to come up with a term that might better explain arki_lab’s approach. We are still working towards finding the perfect term. We discussed who might read a book about the office’s design philosophy and what would be the most important things for a reader to take away. We all agreed that the book should be humble, instead of reading like a portfolio. Some of us thought it would be important to discuss the office’s place in a tradition of Scandinavian design principles. We all agreed that one of arki_lab’s strongest talents is how to facilitate creative participation through the tools they have developed. We discussed arki_lab’s graphic identity and agreed that collage techniques, playful aesthetics, and the use of conversational “personas” are all necessary to include in the finished product. At the conclusion of my internship, I have completed a working synopsis, which you will find below. I also have determined an organizational framework for the book and selected arki_lab’s most important projects to include alongside its participatory design tools. I look forward to seeing how the book’s development progresses! I think it will include takeaways that appeal to a broad audience. It will be fun and interesting to read and visually inspiring. Arki_lab’s book is a comprehensive guide to involving individuals and communities in co-creation practices, specifically in the processes of architectural and urban design. From the beginning stages of our office’s development, we have been committed to rethinking outdated formulas for the design process. With that passionate focus on testing solutions and learning from mistakes, we now wish to share the work of our office as a culmination of challenges, solutions, successes and failures. As we matured as an office, we developed “arki_tools” to tackle the issues at hand, and we believe these experiences should be shared with other community facilitators, designers, and citizens through a “tool kit” of different involvement strategies. This tool kit will be integrated throughout the book within anecdotal retellings of our most important projects, so that the reader understands the context in which each of our tools might be used and how project development was dependent upon those tools. Our organizing principle for the book follows the organizing principle of our office. We believe making architecture necessitates a combination of three elements: education, community building, and physical impact. A successful project falls within a minimum of two of those categories, and over time we have been working toward a goal of completing projects that belong in all three. Through the book’s chronological formatting, we will reveal how we have circulated through these different categories in an attempt to reach our goal of physical outcomes informed by co-creative processes. Our target audience is broad, ranging from students all over the world interested in alternative ground-up design processes, to municipality members within Denmark, to community organizer everywhere. The book might explore its particularly Scandinavian angle, which would be of interest to anyone outside of Northern Europe who is interested in Scandinavian design principles.